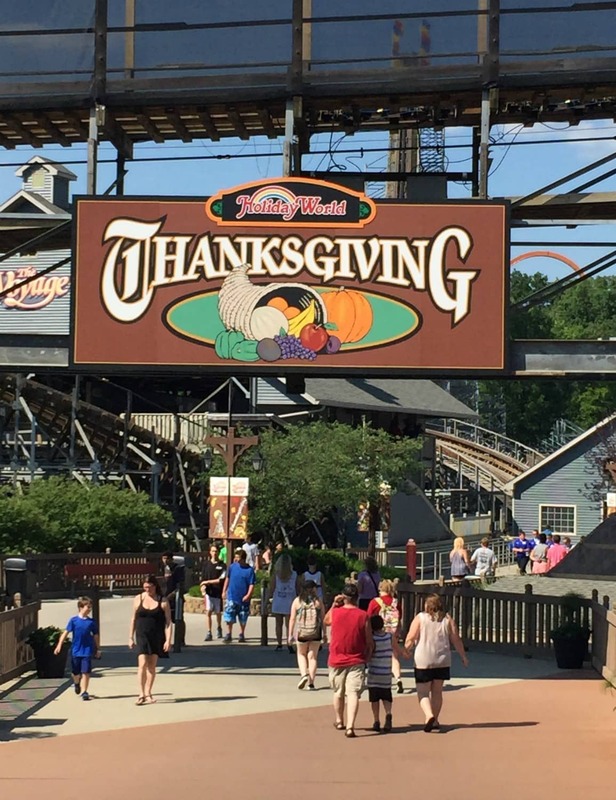 A few weeks ago my family hopped into our car and drove the quick 3 hours down to Santa Claus, Indiana to Holiday World, the nation’s first theme park. I wasn’t sure what to expect, but after we had been there for a few minutes I wondered why we hadn’t done it before. 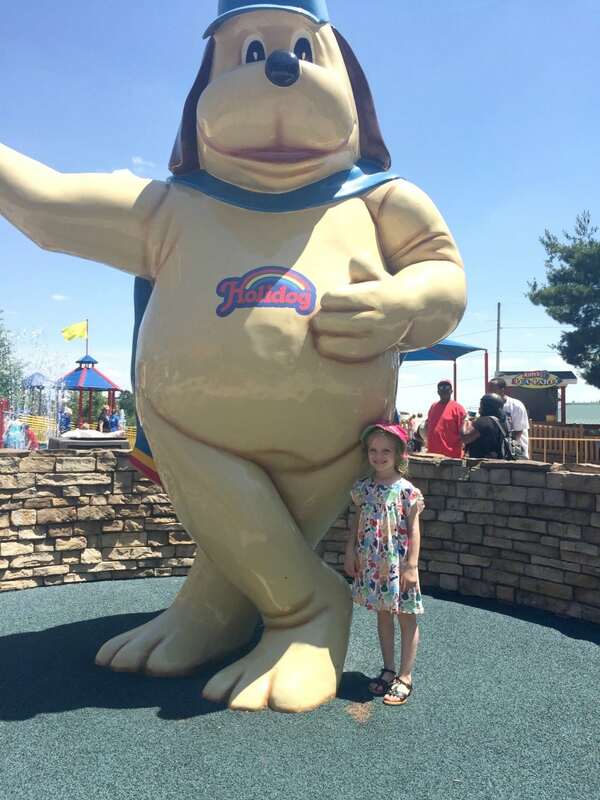 Holiday World is a fun place to take your kids for a weekend of fun and it’s very driveable from Indianapolis. 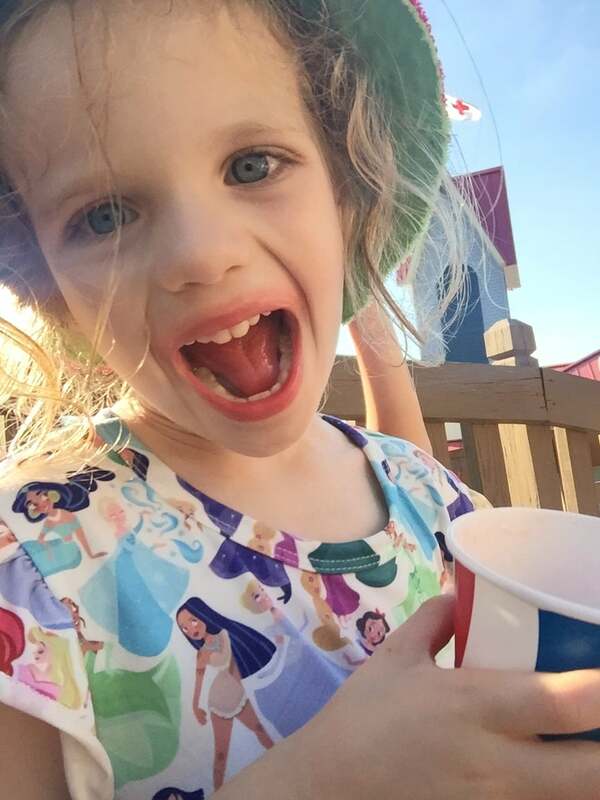 We stayed at Lake Rudolph campgrounds which is right next door (more on our stay at Lake Rudolph later this week), and had a fun weekend at the park, or should I say parks, Splashin’ Safari is a water park built right in the heart of Holiday World. My daughter isn’t as fond of the water as her brother so she and I spent a lot of time in Holiday World while the boys stayed in the water park. We LOVED how family-friendly the park is. 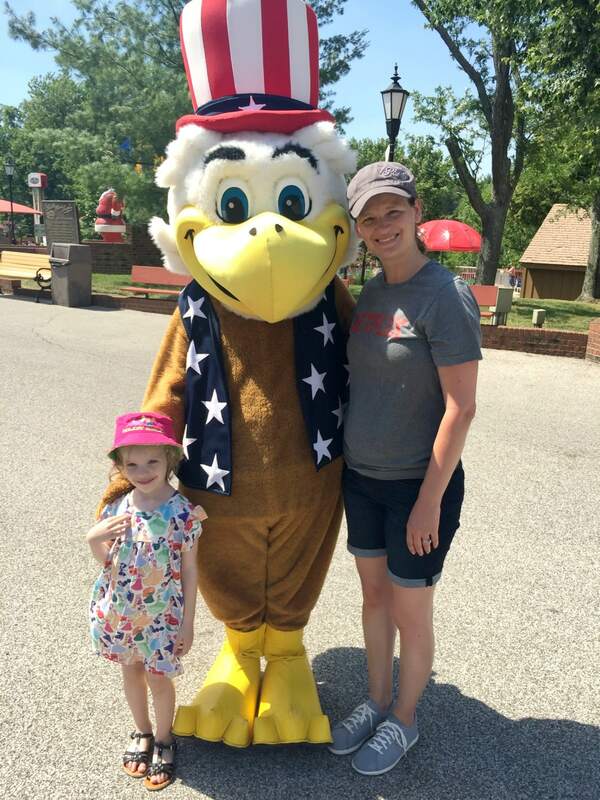 As you might be able to gather, Holiday World is themed around the big holiday celebrations throughout the year. It is divided into 4 sections; Halloween, Thanksgiving, 4th of July and of course, Christmas. Holiday Word sets itself apart from other amusement parks because of how exceptionally clean they keep the grounds. In fact, when we were eating lunch my husband counted over 15 trash cans that we could see from our picnic table. Having these readily available is wonderful especially because Holiday World also offers its guests free soft drinks! Yes, you read that correctly. From the time you walk into the front gates, there are several beverages stations throughout the park where you can fill up on your favorite beverage. The filling stations are great because they have high-speed fans in there to keep any bugs away. It’s brilliant and keeps everyone hydrated on hot days like when we visited. 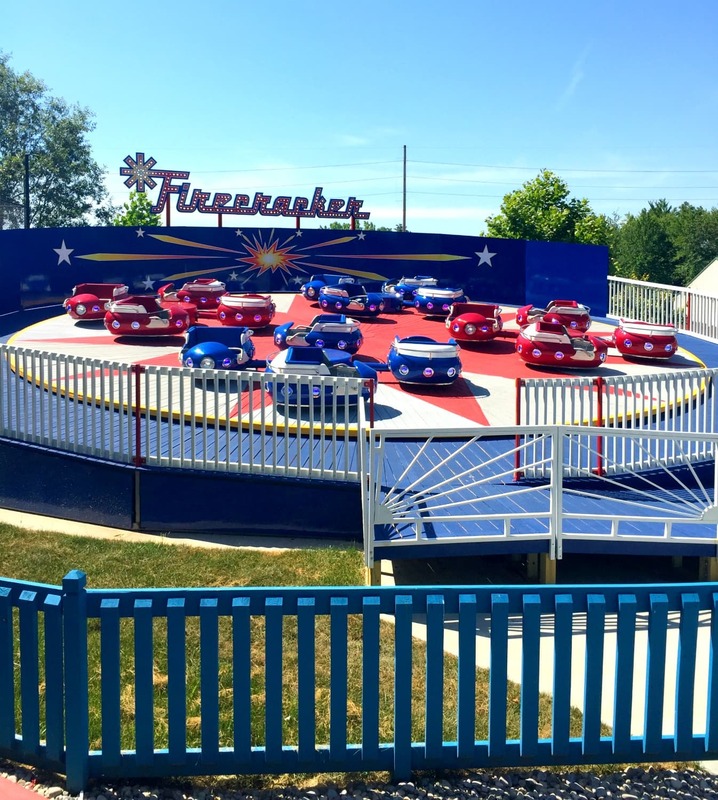 Holiday world also offers its guests free parking, free sunscreen and free park-wide Wi-fi! They don’t want their guests to get dehydrated or sunburnt so they provide products that will ensure that it doesn’t happen. 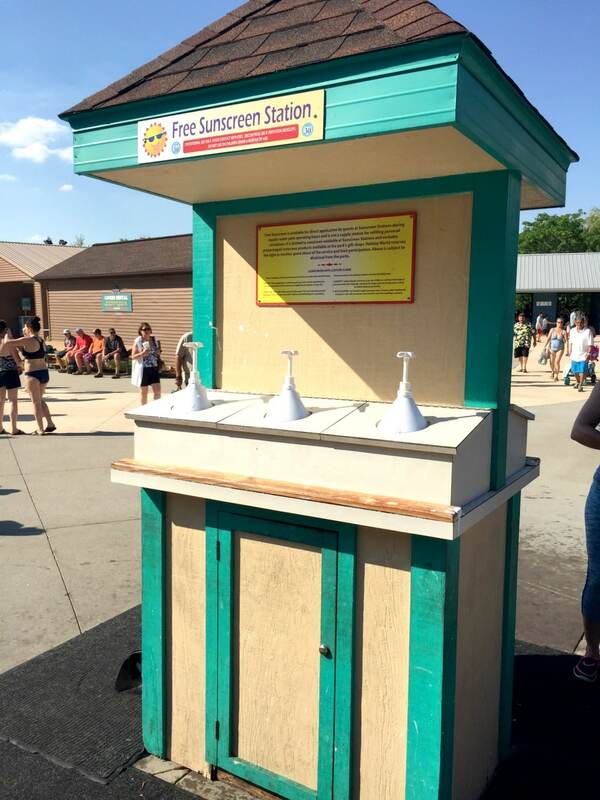 There are several free sunscreen stations in Splashin’ Safari and a couple more in the amusement park. We applied often and were able to keep the sunburns away even on a couple very sunny days! I have never heard of a waterpark or amusement park that offers this to their guests, it’s just one more thing that sets Holiday World apart from the others. I think Caroline and I enjoyed the 4th of July part of the park the best! Nestled into the corner of the park is Holidog’s FunTown, a little park perfect for the young ones. We rode all of the rides that they offered including a fun little roller coaster, some teacups, and a story book themed train ride! I loved this part of the park because it wasn’t as crowded as the rest and Caroline was tall enough to do anything she wanted in this area. 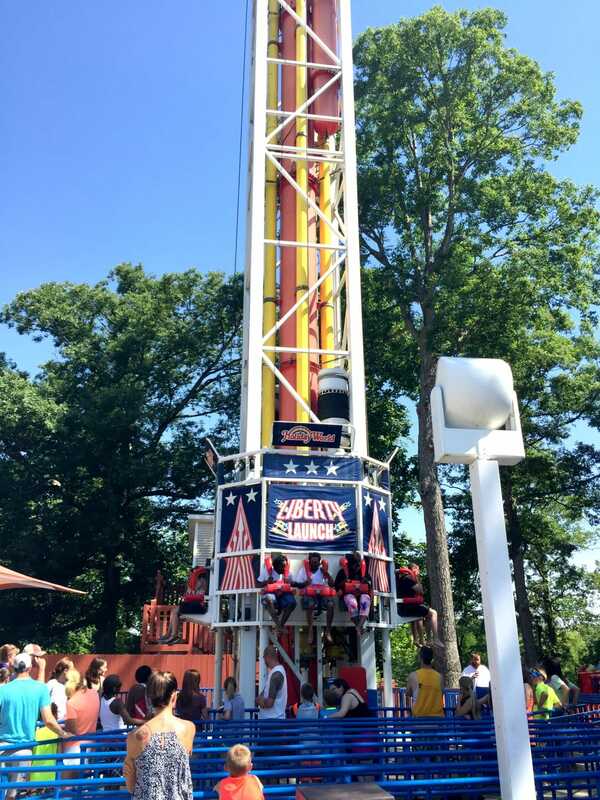 The 4th of July area also features some fun daredevil rides like the Liberty Launch and the newest attraction, the classic Firecracker ride! As a family, our favorite rides were in the Thanksgiving land. 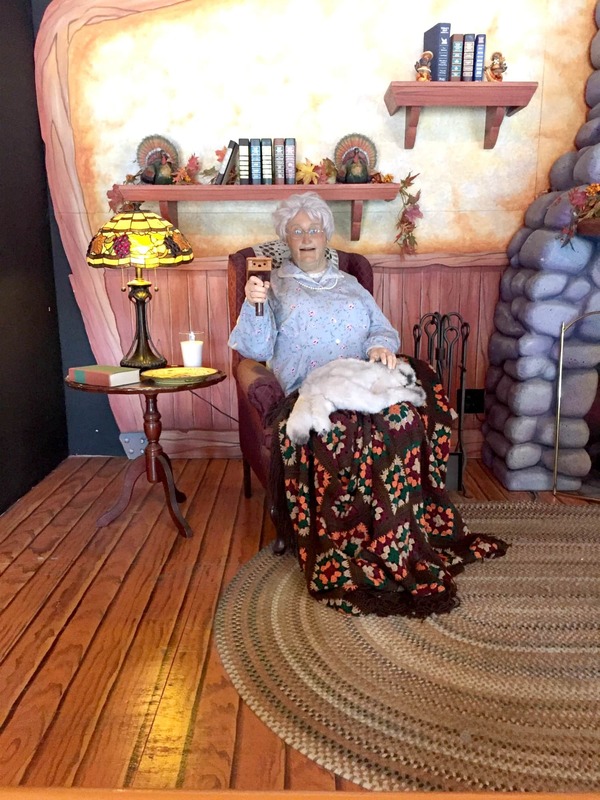 The Gobbler Getaway is a ride where participants use their Turkey Callers to try to capture missing fowl to see who gets the highest score. You use your Turkey Caller to aim at targets and if you aim correctly your score (which is lighted up on your dashboard) will increase. Not to be modest or anything, but I creamed my entire family! Christmas land was, of course, the place where you could meet Santa Claus! 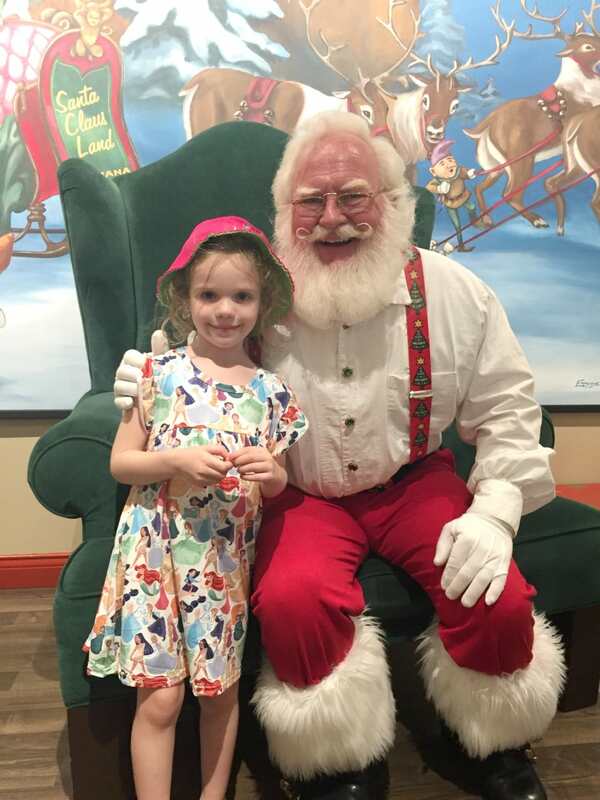 My daughter had been asking to meet the big man since she found out that we were going to Holiday World. We found him in Mrs. Claus’ bakery. In addition to Santa, we also found some delicious treats and had to try some. 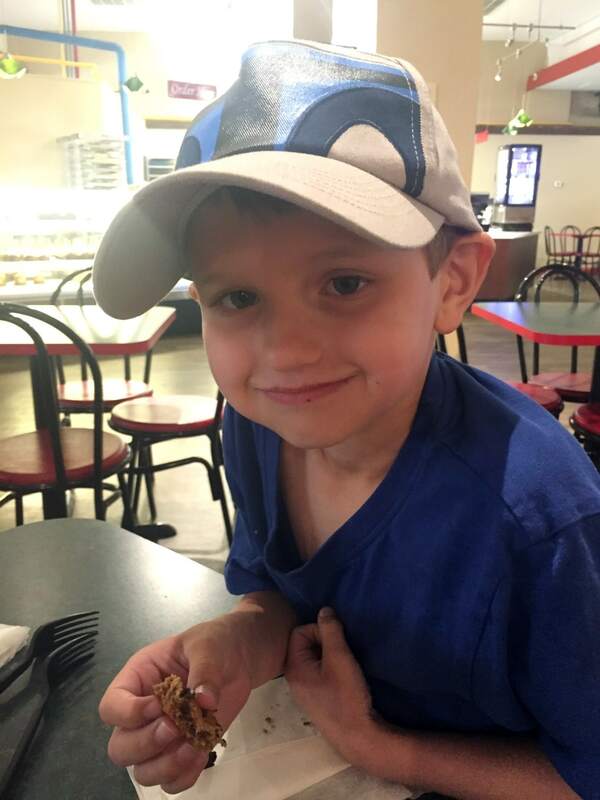 Jonah chose a cookie that was almost as big as his head! It didn’t take him that long to devour it. Christmas Land also housed a little amusement park for the little ones. Some of these rides are original to Holiday World when they opened their doors as Santa Claus Land in 1946. Both of my kids loved this area and we had to come back twice to ride the rides over the course of our weekend. Halloween land houses two of the most favorite roller coasters in the park, The Raven, and The Legend. The kids were too small to ride the coasters but my husband decided to ride The Raven and told me he screamed the entire time. 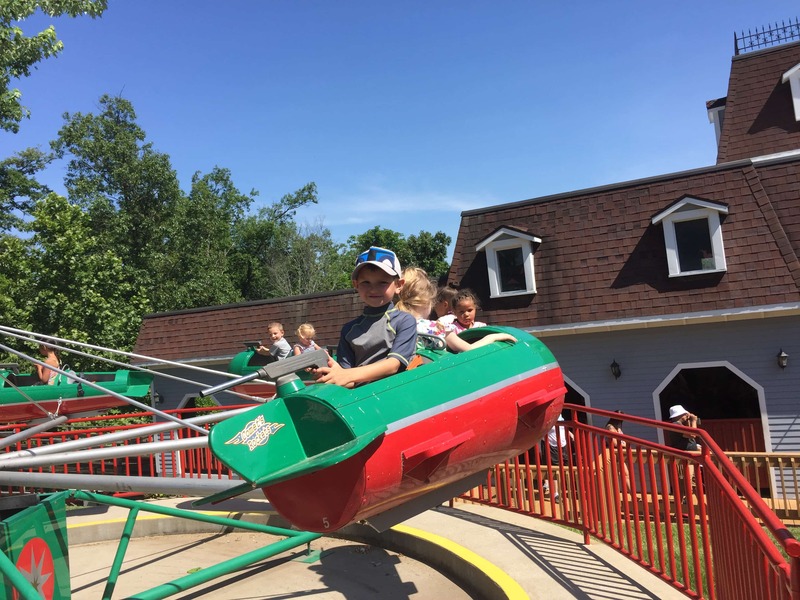 Holiday world suggests that those who want to ride the coasters work their way up by riding The Raven first, then The Legend; and save The Voyage and Thunderbird for last! As mentioned before, nestled inside Holiday world is Splashin’ Safari Water Park. We LOVED this water park and spent most of our time here. We have so much to share about this water park so be sure to return later this week to hear about all the fun things we did! Here is a short overview video of Splashin’ Safari for now! Be sure to check back this week to hear more about our time at Splashin’ Safari and our stay at Lake Rudolph.